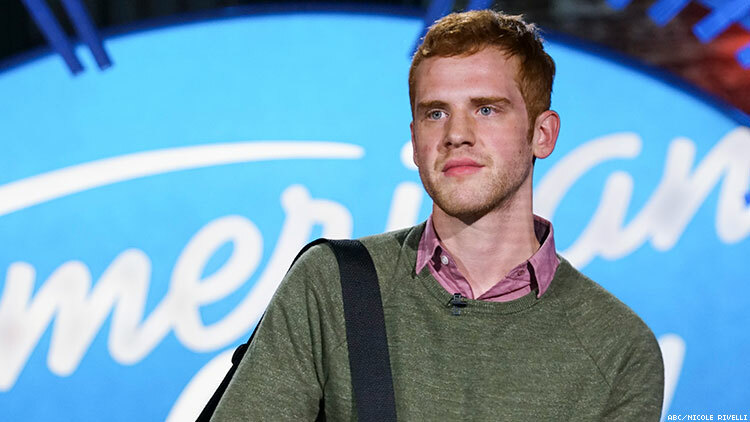 Since his audition, American Idol contestant Jeremiah Lloyd Harmon has been a clear frontrunner. The Maryland-based musician is everything the Idol audience loves: stunning talent buffeted by an emotional backstory. It wasn’t only Harmon’s original song “Heaven” that helped him go viral and secure the coveted golden ticket to Hollywood, it was the message behind it: Harmon — like judge Katy Perry — is a pastor’s kid whose sexuality had set him at odds with his family. Matched with his unique voice and songwriting ability, Harmon was perfectly poised to tug at America’s heartstrings and win over the judges. But Harmon says his relationship with his family and his faith isn’t as black and white as the show presents it — while his parents aren’t accepting of his queerness, he isn’t fully estranged from them. The musician, who was encouraged to audition for the show after producers came across his music online, is aware that the narrative of being the gay pastor’s son whose parents “rejected” him is something that works for TV, but doesn’t necessarily capture the reality of his experience. Out caught up with Harmon after this week’s Idol episode, which featured his spellbinding performance of Fleetwood Mac’s “Landslide” — which he dedicated to his parents — to talk about the truth behind his relationship with his family, what it’s like reckoning with his spirituality as a queer person, and whether he thinks he can be the first gay American Idol. I'm sure you went into this knowing that part of the experience on American Idol is that the audience wants to connect with each contestant's story. Were you prepared to be vulnerable and share your story with America? I think I was prepared. You know, I had been out to close friends and family for about three years when I auditioned, and hadn't really made it like super public yet, but I think I was ready to take that next step of transparency. And obviously it's been a challenging experience doing that, but at the same time, I feel like I've connected with a lot of people and there's obviously so many people that can relate to my story, and so I think that's kind of a cool opportunity to represent other people that are experiencing something similar. What about sharing your story has been challenging? I think the bigger challenge has been just figuring out how to hone my story in that I'm on a TV show, and you know, there's a certain narrative that's put together based off what I say, but at the end of the day, that's the show's story about me. The challenging part has just been standing my own ground and saying, I'm the only person who has the power to actually tell my own story and own it. And the show can say what they want, other people can say what they want, no matter who they are, whether they're family, friends, or people that don't know me. Standing in my own self worth and knowing that it's my responsibility, nobody else's, to say who I am. There is this narrative on the show of you growing up with a religious background, the son of a pastor, and this estrangement from your family that's come from coming out as gay, and I'm wondering how much of that is reality, and how much of that is TV? It's interesting, the narrative that's been told so far, because the things that I've said are that it has been a challenge coming out in a conservative Christian environment, and that my parents don't accept that part about me, which is true. But I've never said that my parents have rejected me, or don't accept me as me, their son. And that in combination with my parents not being able to make it to the first couple performances and [not being] featured on the show yet, you know, it's easy for people to take that and run with it and say, "Oh, Jeremiah's parents are these monstrous, abusive people," which in reality, they're just trying to integrate this experience and they're processing it in their own way. And it's not like they totally outcasted me, it's just ... I was living with my parents, and our differences caused me to decide to make an alternative living situation for myself, you know? And it's a lot more nuanced than it's presented, obviously. But I think at the heart of it, it's just, we have our differences, but we still love each other and are there for each other no matter what. And I think I'm personally really excited to get the full story on the show, like what we look like on the other side of the struggle, after I've quit my dad's church job, after I've moved out. Like what does our relationship look like after that, because the reality is that we've grown a lot together, you know? Do you think that that nuance is something that's not ... that may be the reason that people aren't understanding it is because in this post-woke world we live in, people can't grapple with the idea of someone having their parents not accept their sexuality and still trying to work through that? I think it is a bit of that. It's easy for people to put things in black and white. You know, people want to see this protagonist-antagonist dynamic. And there's a lot more gray to anybody's situation. I think that is really the story that needs to be told, because of course — and not to downplay the reality that there are people who are totally rejected by their loved ones because of their sexuality — but I think it's also just an important story to tell that there's also people that are just really grappling with trying to be normal and trying to keep that conversation going with their family, and to coexist even though they disagree or can't accept someone's sexuality. I think that's almost even more of a difficult story to tell. It's also very representative of where our country is right now. Yes, I agree totally. Things can get polarized so quickly, but it's easier to polarize. It's easier to just say, "You're not like me, you're different, and we need to combat each other because of that." But it's more difficult to say, "Maybe we have more in common than we think, and we can actually work out our differences even if it doesn't mean that we are landing in the same place, you know?" You're a pastor's son, so do you consider yourself a religious person? A lot of queer people don't feel comfortable with spirituality because the institution of religion is not one that's generally welcoming to queer people. How do you grapple with being a queer spiritual person with such deep ties to a religious institution? For me, I just find people that have something in common with me, and I think that there's a lot of queer Christians and a lot of LGBTQ folk who are pushing the conversation about what is culturally acceptable today, and how has our religion shaped itself based off of culture and societal norms. And what kind of context should we be considering with certain passages of scripture, and so on. I'm interested in where Christianity is headed in that regard, and I think that since I come from that religion, then my opinion and my experience is like a valid piece to that discussion, you know? So, I'm willing to engage in that, but at the same time, I sort of ... I keep a distance with it, for certain reasons. For your audition, were you encouraged to perform an original song? A lot more contestants have been doing original music this season, but generally it's something of a risk on American Idol. That was what I was most excited about actually, because I've wanted to introduce myself to America as not just a singer, but a songwriter, and yeah, it was a risk. I didn't know how they would respond to it, but obviously it was the right choice and I'm glad that they connected to it the way that they did. I'm excited for what that implies for me as a songwriter, you know, for my long term career after this show is over. Of the three judges, whose criticism do you respond to the best, and who are you finding yourself wanting to impress the most? I think Katy Perry kind of connected. She's a pastor's kid and she opened up with me in Hawaii, and took a moment to say, "I see you, I affirm you for who you are." And took that and felt very good about that. Man, I'm always finding myself a little intimidated by Lionel Richie, ‘cause he's so much of a legend already. And he's very articulate and intentional with everything that he says. It seems like he really thinks about it, and what he says really matters. It's not like him just reacting. So I'm more nervous to see what Lionel has to say sometimes. Who are some artists who you look up to who you would want to maybe model your career after? Well, a few names come to mind. I really love Jeff Buckley as a vocalist and a performer, and I love Sufjan Stevens, Leonard Cohen, Paul Simon. Just good songwriters. It’s funny that you mention Sufjan Stevens because every time you're on screen, they start playing that song from Call Me By Your Name. I keep expecting them to get a shot of you holding a peach. Maybe they will at some point. One of the things that you said in your audition that really kind of stuck with me was, "All of my religion has been stripped down to ‘I love you no matter what.’" Can you tell me a little bit more about what that means? Well to me that means if you're so religious that it becomes a barrier to a relationship with someone, I think your religion has become obsolete. Everything that I've learned through Christianity, being raised in that, just comes down to loving your neighbor as yourself, loving God. It's very simple in its intent. My understanding has always been that Jesus was an example of how institutions and religion are really subservient to relationships and learning how to treat people with dignity and respect and just love. Your boyfriend has been with you throughout the show. What has it been like to have him there? I've been dating John for a year and two months now, and he's been amazing. He's been there for every audition, every performance. We met at the YMCA in Kingsville, Maryland, and I was walking to the gym and he passed by and said hi, and I thought that I had recognized his face, and it took me a while to remember that a year and some change before that we had matched on Tinder. I decided I should just walk up to him and give him my number. So after my workout, I went to my car and grabbed this like three by five lyric card thing that I had been working out song words on, and I wrote my name and number on the back, walked up to him, and I said, "I feel like I saw you online somewhere, but in case you ever want to chat or whatever, text me." And so we ended up getting food that night and have been seeing each other ever since. And we have very similar backgrounds. He actually graduated from the same college that my parents did, which is this tiny Bible school in Indiana. And he comes from the same branch of Christianity, Independent Fundamental Baptist. He's also a musician, and so we've connected on a lot of levels, and he's been really amazing and supportive. Watching the show, it's been very clear you're happy to be there but still very surprised at how well you're being received. Are you starting to want it? Are you in it to win it? I find myself getting a little competitive on the inside more than I want to, and the closer that I get, it's kind of like, maybe I could do this. I didn't plan to get this far, but what would it be like to win, you know? I think either way I'm just excited about the platform that I've been given, and I think no matter what happens I'll be able to keep taking this journey in some other way. But yeah, I'm kind of getting closer to the finale and I'm like, maybe I could. Maybe I could take this, you know? Maybe you could be the first gay American Idol. Maybe so. That would be monumental, I think.